Dedicated to introducing healthy, sensible college planning solutions to students, parents and educators, Peter Van Buskirk is a leading voice on behalf of student-centered college planning. 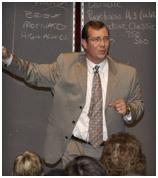 More than 100,000 students, parents and educators around the world have benefited from Peter's innovative and provocative messages in presentations of "The Admission Game®", Getting From Where You Are to Where You Want to Be" and other Best College Fit programs. Click on the following pages to preview the programming Peter delivers to various audiences and then contact Peter at Peter@BestCollegeFit.com to find out how BCF programs can meet your constituent needs. A. Contact Peter at 717-808-5462 or Peter@BestCollegeFit.com. Q. What do people have to say about Peter's programs? A. Here is a sampling of testimonials. Please see Present/Past Clients and Testimonials for more. "No one from my family has ever attended a four-year university before, so we are appreciative for your advice regarding this complicated process. I know so many other kids are going through the same turmoil as I am with regard to this whole "admissions game" and would benefit from your advice. I am so glad I attended your seminar, and thank you again for taking the time to set me on the right path." "I truly consider you a leader in the field, someone who tells it like it is. That is what sets you apart… I defer to you anytime!" "Brilliant, passionate, fantastic! Thanks for breaking the code and sharing with us." Q. Do you provide other resources that compliment your programming? A. Yes! Check out the BCF Bookstore to find Peter's book, Prepare, Compete, Win! The Ultimate College Planning Workbook for Students. Other sources of information and advice may be found in Resources for Students & Parents.